Though full of information, the book is a quick read with many clever tidbits, starting with the enticing title. 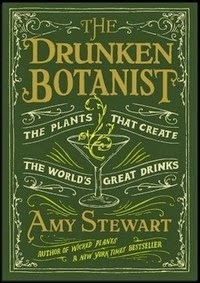 Then on to the introduction - “Aperitif” and concluding with “Digestif.” Sections on “have a nice glass of corn” (blended whiskey, bourbon, corn beer) and “bugs in booze” (cochineal, bugs carrying yeast, honeybees) spice up the encyclopedic listing of plants, trees, herbs, spices, nuts, seeds, fruits and vegetables which are used to make alcoholic drinks and garnishes. There is ample information on growing each plant and how parts of the plant are prepared to make the drinks. Some examples: Juniper berries for gin are “actually cones whose scales are so fleshy that they resemble the skin of a fruit – take two to three years to mature…” and, like cacao, they are at different stages on each tree. Gin is “...really nothing more than a flavored vodka.” Cloves are the flower buds dried. Suggestions are given how to properly drink the drinks, such as good sake should be cold. The ‘worm’ in mescal/tequila (from the Agave plant) is a marketing tool for cheap versions. Stewart also clarifies some drunk animal misconceptions - the bear on Madrid’s coat of arms eating from a strawberry tree is not drunk, and elephants do not get drunk after eating marula – contrary to numerous videos on the web. Initially I took out an audio version from the library for a trip to a food history symposium, and liked it so much I started telling friends there that they should read the book. Then I checked out the hard cover book for a faster read. So it is not surprising I decided to write a positive book review. Whether you choose to read a section/entry at a time or more, there are many gems of new information, or different ways of looking at an old drink.